Tai Chi Chair | OhGizmo! By Andrew Liszewski on 12/31/10 • Leave a comment! 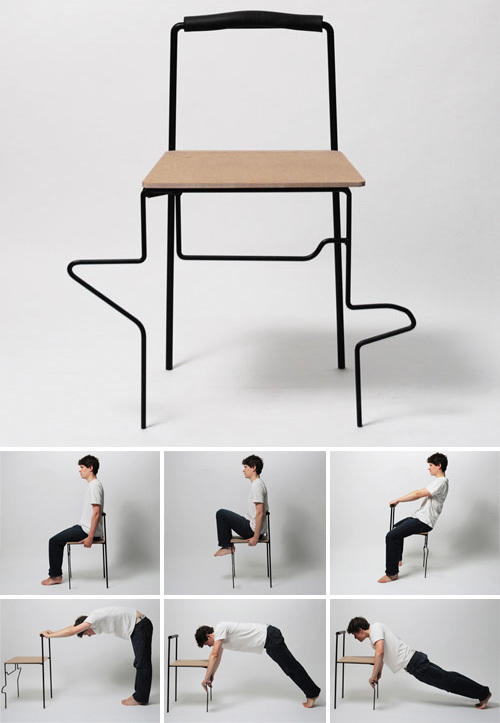 Ironically, while this Tai Chi Chair, designed by Ecole Superieure d’Art de Design De Reims student Yuan Yuan, is supposed to provide relief at the end of a long day by providing handholds and footholds for performing various Tai Chi poses, its flat bottomed seat and minimal support would probably do a real number on your spine if you had to sit on it all day long. So in the long run you can save yourself the pain, and the exercise, by just avoiding it all together.